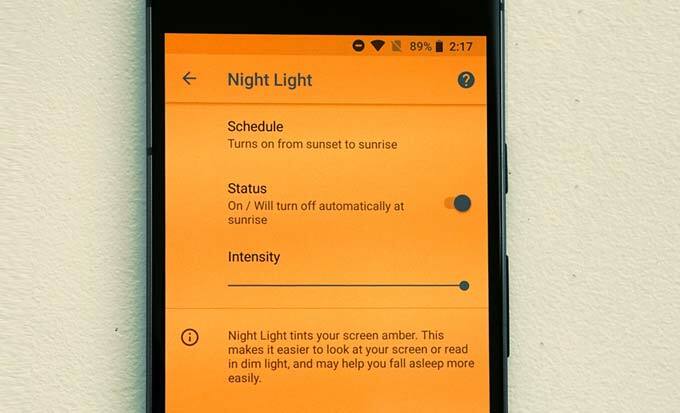 Google Pixel or Pixel Xl has a feature known as Night Light, this new setting reduces the amount of “blue light” displayed by your phone screen. The existence of this new suit can help you mobile users who often have trouble sleeping at night after you use the phone. This can happen because the eyes constantly receive a reflection of light from your mobile phone at night. With Android 7.1 Nougat on the board, you can now enable Night Light on Google Pixel and see for yourself whether removing blue helps you fall asleep more easily. Here are some simple steps that will help you set up Night Light on Google Pixel and get rid of malicious blues by manually activating or deactivating Night Light. A few hours before your usual bedtime. Tap the Settings icon on the right side. Go to Settings > tap on Display. You will now see the option to set up a schedule: choose from Never, Custom schedule, or Sunset to sunrise (recommended). Under Status toggle On / Turn off automatically for the Night Light to enable automatically at the scheduled time. Swipe down once more to get the Quick settings menu. Tap on the Night Light icon (moon) to easily turn on or off the light. Those is a simple tips to set up Night Light on your Google Pixel or Pixel XL.